What Is a Change Ambassador? Change Ambassadors are senior members of the University who are committed to visibly supporting the Programme and cascading change programme information to their teams. They work closely with the Change Champions. They are usually School Managers, Deans, Associate Deans, Directors and Senior Directorate Managers. The Change Ambassador needs to be aware of how business transformation is linked to the successful delivery of the University’s strategic priorities and objectives as identified in the Strategy to 2022. The Change Ambassador’s role is to provide advice and guidance to the programme team, with their understanding of University policies and procedures. They may also assist with assessments of the impact of the change upon their staff and any whether adjustment to the proposed new solution or training is required as a result. Additionally they ensure that the relevant information is cascaded to all staff in their school or directorate. Ambassadors are critical to the success of the Programme. They are also in a position to support the programme by ensuring that their staff are released to undertake Programme duties such as training. Ambassadors are given information about the progress of the Change Programme so they can communicate it through their management structure or at team meetings. They also support the Change Champions, ensuring they are able to fulfil their Change Management duties. The Programme Team provide the Ambassadors with monthly communications briefings that highlight programme activity and provide assistance on help them manage change in their School/Directorate. If you wish to know more about the Change Ambassador Programme, please contact business-transformation@dundee.ac.uk. Author Posted on 29th May 2017 13th December 2017 Categories Finance and ProcurementLeave a comment on What Is a Change Ambassador? As we get closer to implementation we thought we’d share some of the things that are going to change as a result of Business Transformation and the implementation of the OneUniversity solution. The introduction of self-service functionality will empower staff to take control of their own information. For more information on the Change Programme contact business-transformation@dundee.ac.uk. Acceptance criteria The requirements and essential conditions that have to be achieved before a deliverable is accepted. Assumption An event or circumstance expected to happen during the project lifecycle based on previous experience or high level historical data. Project assumptions are potential risks as they may not be true. Assumption analysis is therefore one of the techniques used in risk identification. Benefit The quantifiable and measurable improvement following from the completion of deliverables and resultant business change that is perceived as positive by a stakeholder. It will normally have a tangible value that will justify the investment. Benefits management The identification, definition, planning, tracking and realisation of business benefits. Benefits realisation The practice of ensuring that benefits are derived from outputs and outcomes. Board A body that provides sponsorship to a project, programme or portfolio. The board will represent financial, provider and user interests. Bottom-up estimating An estimating technique that uses detailed specifications to estimate time and cost for each product or activity. Business analysis A research discipline of identifying business needs and determining solutions to business problems. Solutions often include software-systems, improved processes, organisational change or policy development. Business-as-usual An organisation’s normal day-to-day operations. Capability The completed set of project outputs required to deliver an outcome; this exists prior to transition. It is a service, function or operation that enables the organisation to exploit opportunities. Centre of expertise (COE) A coordinating function ensuring change is delivered consistently and well, through standard processes and competent staff. It may provide standards, consistency of methods and processes, knowledge management, assurance and training. It may also provide strategic oversight, scrutiny and challenge across an organisation’s portfolio of programmes and projects. This function provides a focal point for driving the implementation of improvements to increase the organisation’s capability and capacity in programme and project delivery. Change control The process through which all requests to change the baseline scope, schedule and budget of a project, programme or portfolio are captured, evaluated and then approved, rejected or deferred. Change request A request to obtain formal approval for changes to the scope of work. Communication The means by which information or instructions are exchanged. Successful communication occurs when the received meaning is the same as the transmitted meaning. Comparative estimating An estimating technique based on the comparison with, and factoring from, the cost of similar, previous work. Complexity Complexity relates to the degree of interaction of all the elements that comprise P3 management and is dependent on such factors as the level of risk, range of stakeholders and degree of innovation. Deliverable A product, set of products or package of work that will be delivered to, and formally accepted by, a stakeholder. Disbenefit A consequence of change perceived as negative by one or more stakeholders. Escalation The process by which issues are drawn to the attention of a higher level of management. Estimating The use of a range of tools and techniques to produce estimates. Gate The point between stages where a go/no go decision can be made about the remainder of the work. Governance The set of policies, regulations, functions, processes, procedures and responsibilities that define the establishment, management and control of projects, programmes or portfolios. Issue A formal issue occurs when the tolerances of delegated work are predicted to be exceeded or have been exceeded. This triggers the escalation of the issue from one level of management to the next in order to seek a solution. Issue register A document listing and describing identified issues. Lessons learned Documented experiences that can be used to improve the future management of projects, programmes and portfolios. Objectives Predetermined results towards which effort is directed. Objectives may be defined in terms of outputs, outcomes and/or benefits. Outcome The changed circumstances or behaviour that results from the use of a capability. Outcomes are desired when a change is conceived. Outcomes are achieved as a result of the activities undertaken to affect the change. Output The tangible or intangible product typically delivered by a project. Planning Determines what is to be delivered, how much it will cost, when it will be delivered, how it will be delivered and who will carry it out. Portfolio The totality of an organisation’s investment (or segment thereof) in the changes required to achieve is strategic objectives. Are these the projects and programmes needed to deliver the strategic objectives, subject to risk, resource constraints and affordability? Is the organisation delivering them effectively and efficiently? Are the full potential benefits from the organisation’s investment being realised? Portfolio management A coordinated collection of strategic processes and decisions that together enable the most effective balance of organisational change and business as usual. Portfolio, programme and project management (PPM) PPM is the accepted term that covers portfolio as well as programme and project management. Portfolio, programme, and project offices (P3O) The decision-enabling and support business model for all business change within an organisation. This will include single or multiple physical or virtual structures i.e. offices (permanent or temporary), providing a mix of centralised and localised functions and services, and integration with governance arrangement and the wider business such as corporate support functions. Product A tangible or intangible component of a project’s output. Synonymous with deliverable. Programme A temporary flexible organisation or structure created to coordinate, direct and oversee the implementation of a set of related projects and activities in order to deliver outcomes and benefits related to the organisation’s strategic objectives. A programme is likely to have a life that spans several years. Programme management The coordinated organisation, direction and implementation of a dossier of projects and transformation activities (i.e. the programme) to achieve outcomes and realise benefits of strategic importance. Project A temporary organisation that is created for the purpose of delivering one or more business products according to an agreed business case. Project management The planning, delegating, monitoring and control of all aspects of the project, and the motivation of those involved, to achieve the project objectives within the expected performance targets for time, cost, quality, scope, benefits and risks. RAG reporting Red, amber, green reporting is used to indicate how well an initiative is progressing. It is often linked to tolerances set around critical success criteria to ensure more than just a subjective assessment of the initiative status is taking place. Reports 1. The presentation of information in an appropriate format (e.g. management report). 2. A written record or summary, a detailed account or statement, or a verbal account. Requirements management The process of capturing, assessing and justifying stakeholders’ wants and needs. Resource management The acquisition and deployment of the internal and external resources required to deliver the project, programme or portfolio. Resource scheduling A collection of techniques used to calculate the resources required to deliver the work and when they will be required. RAID A RAID log is an effective tool to keep control of the project. It contains Risks, Assumptions, Issues and Dependencies. Risks Events that will have an adverse impact on your project if they occur. Risk refers to the combined likelihood the event will occur and the impact on the project if it does occur. If the likelihood of the event happening and impact to the project are both high, you identify the event as a risk. The log includes descriptions of each risk, full analysis and a plan to mitigate them. Assumptions Any factors that you are assuming to be in place that will contribute to the successful result of your project. The log includes details of the assumption, the reason it is assumed, and the action needed to confirm whether the assumption is valid. Issues Something that is going wrong on your project and needs managing. Failure to manage issues may result in a poor delivery or even complete failure. The log includes descriptions of each issue, its impact, its seriousness and actions needed to contain and remove it. Dependencies Any event or work that are either dependent on the result of your project, or on which your project will be dependent. The log captures whom you are dependent on, what they should deliver and when. It may also include who is dependent on you. Risk management A process that allows individual risk events and overall risk to be understood and managed proactively, optimising success by minimising threats and maximising opportunities. Risk register A document listing identified risk events and their corresponding planned responses. Stage The major subdivision of the gated business change life cycle. Stakeholder An individual, group, or organisation, who may affect, be affected by, or perceive itself to be affected by a decision, activity, or outcome of a change initiative. Stakeholder management The systematic identification, analysis, planning and implementation of actions designed to engage with stakeholders. Timebox The production of project deliverables in circumstances where time and resources, including funding, are fixed and the requirements are prioritised and vary depending on what can be achieved within the timebox. Target Operating Model (TOM) This defines the way we should work once the new ways of working are implemented. It provides a benchmark to make sure we’re doing the right things. Tolerance A permissible variation in performance parameters often set in terms of time, cost, scope, quality, risk and benefits. Workflow The series of activities that are necessary to complete a task. 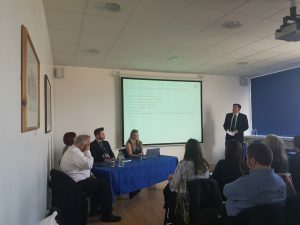 Almost 200 users of PECOS and other finance systems recently attended a series of information sessions in City Campus and Ninewells, to learn about the changes to the policies and procedures as we transform to OneUniversity. 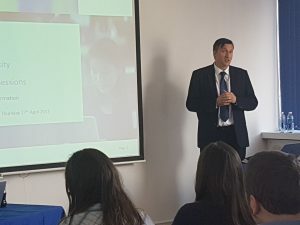 The staff, who were drawn from Directorates and Schools, were welcomed by Director of Finance, Andrew Hewett, who talked through the need for change and how it would bring clarity and efficiency to our financial processes. Staff were taken through the details of the new finance and purchasing solution with purchase flow charts and videos, and subject matter experts were on hand to answer questions from staff. There was also a chance for staff to log their most challenging and difficult finance tasks on a ‘Wall of Pain’ and these have been collated by the Programme Team to be used during testing. 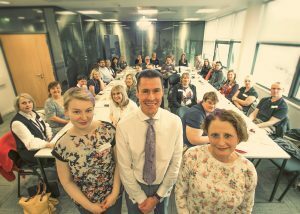 University of Dundee Change Champions recently held their inaugural meeting in the Dalhousie Building on City Campus. The Change Champions are members of staff from all disciplines, schools and campuses, who have volunteered to learn more about the transformation programme and OneUniversity solution on behalf of their teams. The Change Champions are able to ensure that the views of their teams are represented in Business Transformation and can feed back information regarding how it will affect them. The champions knowledge and understanding of the new processes will help them provide front line advice when we move to the new ways of working. After a welcome from Dr Jim McGeorge, the team were introduced to staff working on the programme, who went through the issues that Business Transformation is tackling and what it is aiming to do. This was followed by a discussion on the members’ opinions of how they felt the changes should be introduced to their teams. In future sessions, the group will split into teams that will look at individual subject areas that are of particular interest in order to help everyone change the way they work. This will be an excellent way to test how OneUniversity handles common issues and the Change Champions will be able to take this knowledge back to their teams.